Three container services currently use Greenock's Ocean Terminal on a Friday, and today two vessels were seen alongside. Closest is CANOPUS J on the MacAndrews Greenock-Bilbao-Liverpool service while at the west end, LAURA ANN was loading on the OOCL SIX service, running between Southampton, Dublin, Greenock and Belfast. 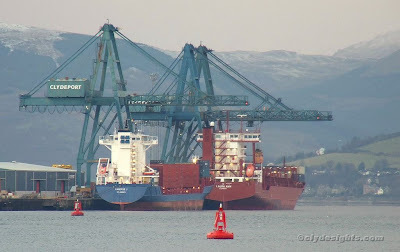 LAURA ANN is a fairly new visitor, and is one of the well-known Sietas 168 type container ships. Owned by Eicke Shipping, this 11,639 tonne deadweight ship is 134 metres long, and has a maximum capacity of 868 TEU boxes. She was built in 2002, and like many vessels of her type, has carried other names while on different charters. The third container ship to visit Greenock today was HELGALAND, also on charter to MacAndrews but running on their other Northwest UK-Iberia route, serving Portugal.